As the United States continues to climb out of and recover from the effects of the Great Recession, the economy as a whole seems to be steadily improving. This was one of the main reasons for the recent Federal Reserve interest rate hike from 0.75% to 1%. Prior to this, rates had barely changed in almost 10 years. The Federal Reserve, or “the Fed,” serves a few different functions, including the regulation and supervision of banks and other financial institutions, influencing credit conditions, and making sure we have a stable economy. The recent hike in interest rates falls under the “influencing credit conditions” umbrella. Since the beginning of the Great Recession in 2008, the Fed has kept target interest rates extremely low to try to get the economy going again. But now that the economy is back on its feet more-or-less, the Fed is looking to make a few incremental increases within the next year. 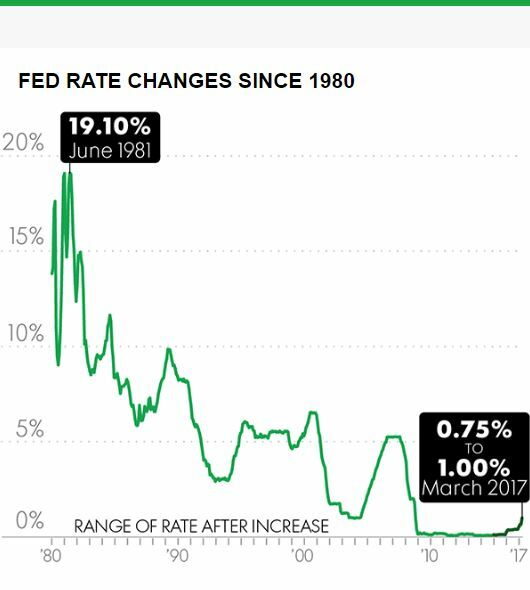 What does the Federal Reserve interest rate hike mean for you? Raising interest rates is a sign that the economy is doing well. Unfortunately, increased interest rates also mean that some things are about to get a little more expensive. For example, if you have credit card debt with a variable interest rate, that rate will increase as a result of these hikes. The longer debt is left unpaid, the more we pay in interest charges – and this is even truer now that rates are higher. Interest rates for mortgages and car loans will also be affected. This is a perfect time to seriously consider getting out of debt as fast as possible to avoid incurring more interest than you had planned on. It can seem more manageable to pay debts off over a longer period of time, but depending on the length of the repayment plan and interest rate, the final amount paid could be significantly more than what was owed. Click here to see if you qualify for debt relief services that could have you debt-free in 24-48 months.